Pianist Katelyn Vahala, a USC Thornton undergraduate, and alumna cellist Annie Jacobs-Perkins ’18, are currently touring Holland and Bratislava with the Callisto Trio, which also features violinist Geneva Lewis. On Jan. 13, the trio earned a standing ovation for their performance of Schoenfield, Ives and Dvorak at the Concertgebouw. 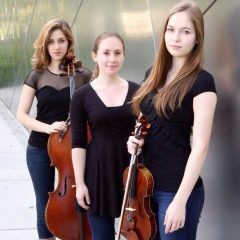 Formed in 2011, the Callisto Trio is the youngest ensemble ever to win a medal in the Senior Division of the prestigious Fischoff National Chamber Music Competition.